This chapter considers the multi-period lot-sizing problem with stationary demands in the initial few periods and possibly dynamic demands in the subsequent periods. Both the average cost and the discounted cost problems are considered. Also, both finite and infinite-horizon problems are considered. 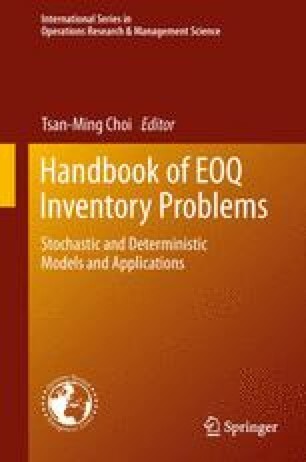 The results presented in this chapter include properties of optimal solutions for these problems, efficient algorithms for solving these, and the forecast horizon property. Most of the results in the chapter are based on the research done by the authors of this chapter and their co-authors over the past three decades. An attempt has been made to make the review in the chapter largely complete and self contained and proofs have been simplified where possible.